Forecast and technical analysis EURUSD on February 08, 2019. On Thursday the 7th of February, trading on the EURUSD pair closed down. The pair slid to 1.1325 during the European session. The euro came under pressure after the release of economic growth forecasts from the European Commission for 2019 and 2020. The GBPUSD pair has dropped to 1.2855, after pressure was piled on the pound in the wake of economic forecasts for the UK published by the Bank of England. The pound and euro both managed to partially recover their losses in the US session. The dollar took a hit after news that US President Donald Trump and Chinese President Xi Jinping are unlikely to meet before the 2nd of March, at which time new tariffs may come into effect. White House economic advisor Larry Kudlow said in an interview with Fox Business Network that the US and China still have “miles to go” in terms of reaching a trade deal. Despite rising to 1.1360, Thursday’s trading on the EURUSD pair closed at 1.1343. 10:00 Germany: current account (Dec). 16:15 Canada: housing starts (Jan). 16:30 Canada: unemployment rate (Jan), net change in employment (Jan). 21:00 US: Baker Hughes US oil rig count. My expectations of a price drop yesterday were met in full. The pair slid to the 135th degree. Despite the fact that there’s a key support at 1.1308, I think we’re going to get an upwards reversal from current levels. At the time of writing, the euro is trading at 1.1337. In my forecast, I expect the 135th degree to be tested, followed by an upwards rebound and a breakout of two trend lines projected from the highs at 1.1488 and 1.1434. For now, I’m expecting a rise to the 45th degree at 1.1374. 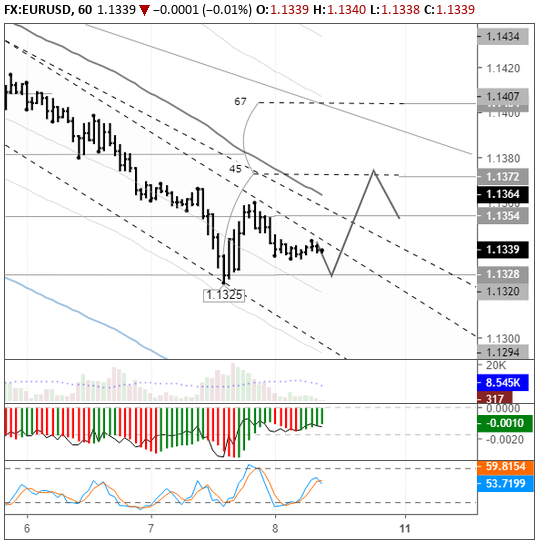 If everything goes according to plan, we can then expect a breakout of 1.1360. Once the bulls gain a foothold above this level, we’ll get confirmation of a double bottom. After successfully testing this level, we can set our sights on 1.1405.